Do you have a spiralizer yet? If you don’t, zucchini noodles are The Reason to get one. 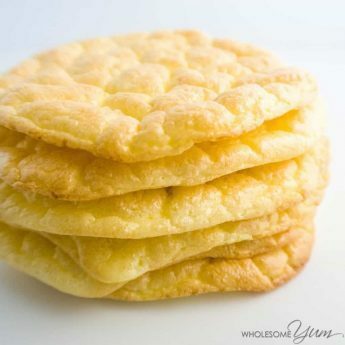 They are the perfect light, low carb pasta replacement. 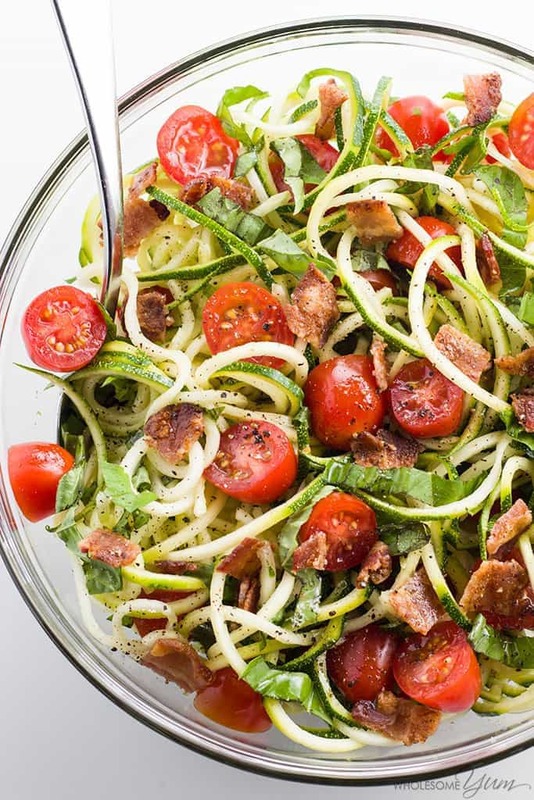 Usually we think of them for warm dishes, but did you know that a cold spiralized zucchini noodle salad is just as amazing? It absolutely is. Especially when bacon is involved. 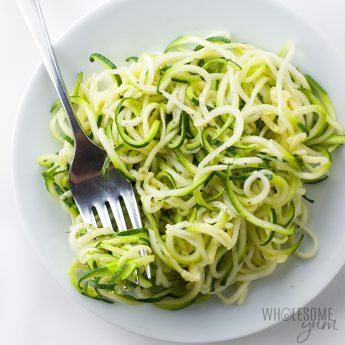 My favorite way to use my spiralizer is to make zucchini noodles alfredo (with healthy alfredo sauce). It’s quick and easy, and feels like comfort food. As another benefit for this time of year, it doesn’t require turning on the oven when it’s So. Hot. Outside. That’s always a good thing in August, but salads are even better to beat the heat. That’s where a low carb zucchini noodle salad comes in. If you’ve been following along, you know that Zucchini Week is in full swing here at Wholesome Yum! I’m sharing new low carb zucchini recipes every day this week. If you haven’t checked out the zucchini pizza bites and fried zucchini & squash recipes yet, go take a peek. Today, Zucchini Week is coinciding with another fun event I’m participating in: Bacon Month!! (I’ll bet that caught your attention. ;)) Some of your favorite recipes on the blog are made with bacon, including bacon wrapped asparagus, bacon cheeseburger soup, and cream cheese jalapeno poppers with bacon. So, I was excited to feature bacon in more recipes. They are all posting a bacon recipe today. 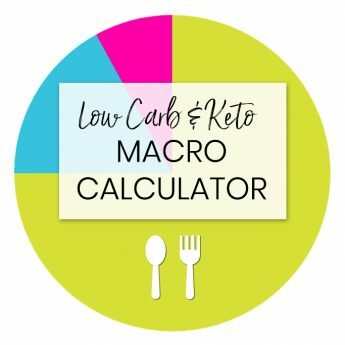 Not all of the other bloggers’ recipes will be low carb, but of course mine will be. 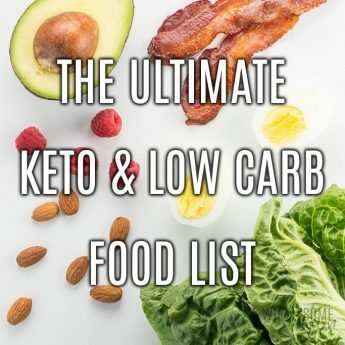 For the rest, I’ll definitely try to adapt some of them to low carb versions myself. It’s worth it for bacon. 😉 You can never have too many low carb bacon recipes! Here at Wholesome Yum, I’m actually kicking off Bacon Month with this lighter recipe featuring both bacon and zucchini. You’ll love this easy zucchini noodle salad with bacon and tomatoes! I have to admit, sometimes I’m a bit lazy and don’t feel like pulling out my spiralizer for recipes that need one. I convince myself that I’ll just dice my zucchini instead and it will be just as good. And yes, it works okay, but it’s just not the same! Something about the noodle shape makes spiralized zoodles so much better than plain, old zucchini! It turns out, the same applies for a low carb zucchini noodle pasta salad. Making a spiralized zucchini salad is somehow way more delicious than just cutting up zucchini into one! You’ll want to pull out your spiralizer for this one. 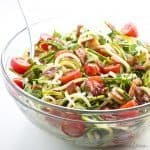 This easy zucchini noodle salad is perfect when you have common summer produce on hand, but have no idea what you’re making for lunch or dinner. For a similar idea to try, check out zoodles with red pepper lemon vinaigrette from My Gluten-Free Miami. 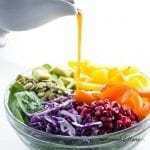 In that version as well as mine, the simple lemon vinaigrette dressing uses common pantry ingredients you probably have right now. 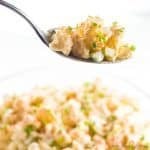 In a small bowl, whisk together the olive oil, lemon juice, garlic powder, sea salt, and black pepper, until emulsified. 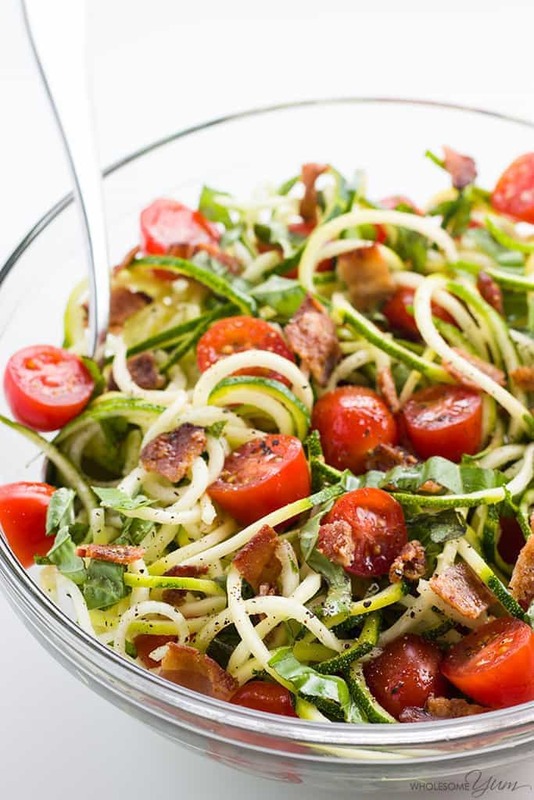 In a large bowl, combine the spiralized zucchini, chopped bacon, halved grape tomatoes, and fresh basil. Toss with the dressing. Serve immediately. I added a few black olives as someone suggested. My man sprinkled it with grated Parmesan cheese, but I preferred it as is. Thank you for a healthy recipe, I will make often. I am so happy you liked the salad, Celeste! Thanks for stopping by! What noodles are used in this? Hi Jaime, they are zucchini noodles! Just made this. Delicious! Thanks! I would suggest patting the “noodles” with paper towels so the salad is not too watery. Thanks for sharing your tip with us, Wendy! Have a nice day! Very tasty! We enjoyed with a little more lemon and chopped onion. Thanks for sharing with us! Please come back again soon! Any suggestions if not using bacon? Thanks. Hi Sue, Feel free to omit the bacon. If you prefer turkey bacon, you can use that as well, or even chicken for some protein to make it a full meal. My new go-to salad! 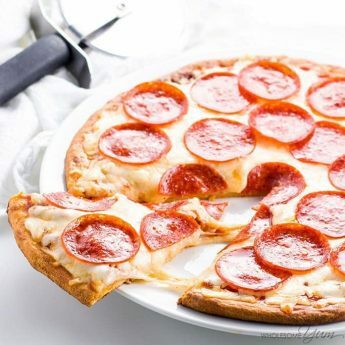 Fast, easy, and delicious! Thanks again Maya! Thank you, Dan! Glad to hear that! Amazing! 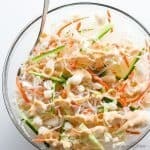 Just what I needed:) I made a giant size cold zucchini salad for a party last week and am making more now for a 4th of July party tomorrow and I can’t wait to eat it already!! Only thing I did differently was adding a touch of rice vinegar and 2 ripe avocados fanned out over the top. If I buy pre spiralized zucchini noodles… how many cups does 3 zucchini make? Hi Deborah, it depends on how tightly they are packed when measuring, but probably approximately 3 cups packed. I added red onion, pepperoni, fresh parm grated, black olives and used fresh garlic in the dressing!! DELISH!! This was absolutely delicious! Even those in my family who don’t care for zucchini LOVED this! Thank you, Kathy! I’m glad you all enjoyed it! Sounds YUM! does it hold well? I’m thinking for a picnic and wondered if it got watery after sitting? Should I salt and rinse the zoodles first??? Thank you, Lorrie! I haven’t tried making this ahead. It might get watery, especially from the salt in the dressing. I’d recommend keeping the dressing separate until you’re about to serve, and that way you can always drain any water right before serving. Salting and rinsing might help and I’ve done this before when making cooked zoodles, but not sure if they’d lose their crunch when using them raw for a salad like this. Let me know how it goes if you try it! Now this is my type of salad! Completely garden fresh, but with a bit of meaty bacon flavor! YUMMY! It is so delicious! Thank you, Renee! This looks FANTASTIC! 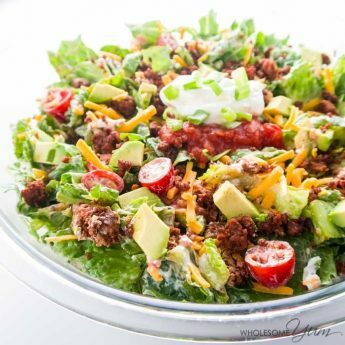 Love the simple ingredient list and that it’s low carb – perfect for my husband’s keto diet! We are low carbing and can’t wait to try this recipe out!